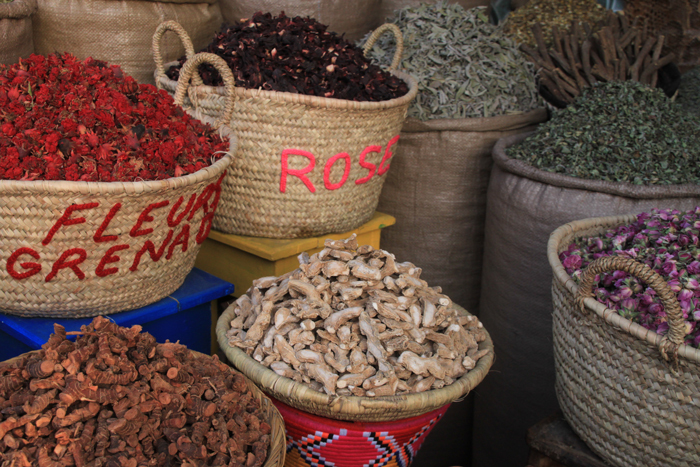 Despite not so good food on the plane, our we enjoyed timely and unventful travels to Marrakesh, Morocco. This is always nice with multiple connections and checked bags. Our biggest delay occurred when we arrived at the very nice new terminal and our driver was not there to pick us up to take us to our riad in the Marrakesh medina! Suman had reserved a ride through the riad in which we were staying, and after a few phones calls and 45 minutes of waiting, our ride finally showed up. I don’t know what took so long as the airport isn’t that far away from the old city center also known as a medina. A medina is a specific city section found in many North African cities which are typically walled with many narrow and maze-like streets. Marrakesh medina is no exception. Thick-walled, interconnecting buildings lined cobblestone streets which zigzagged in every direction. Once designed to confuse invaders, the Marrakesh medina now just confuses tourists! Thankfully we had a driver that knew the location of our riad, as we would have been hard pressed to find it with few streets signs and derbs (or alleyways) pointing in every direction. The car was too large to make it down the narrow streets, so we were met by a baggage porter who wheeled our luggage in an old cart to Riad Karmela where we were staying for one night. A riad is a traditional Moroccan house or palace with an interior courtyard. Most of the riads are located inside the medina, and I highly recommend experiencing at least one night at one of these authentic accommodations. The entrance door to our riad was really low. After ducking into the lobby, we went through the registration process which included being offered a cup of mint tea. Upon finishing our tea in the courtyard complete with a pet tortoise, we followed a staff member up a narrow, twisting stairwell to our second floor room. The place was quite lovely, especially for $70. Aside from the slow pick-up and lousy exchange rate (try the airport instead), this is great place to stay. Our room was named Lailla. The beds were made in traditional quilts and the tile floors were covered in traditional berber rugs. The decorations took on the traditional Moroccan style as well. We only spent a few minutes in our room to change clothes, however, as our guide that Suman scheduled to take us around the souks was already waiting for us for our 3pm appointment. Suman scheduled Youssef for four hours to take us through the Marrakesh medina. What a savvy decision! While the souks are navigable with a map, none of it is easy. Jetlagged, following Youssef through the maze rather than finding our way was a relief! He led us to our (or should I say Suman’s) shopping items of interest. Even for those who don’t shop, like me, a guide is worth every penny, as just having a local around kept the shopkeeping hustlers from bombarding us. Of course, walking as fast as he did helped too! He took us to some very cool places that we wouldn’t have known about or noticed had we just been wandering around lost. Our first stop was on the backside of a hammam, which offers steam baths and massages. We entered a dark chamber with a bed on the right and large compartment of sawdust on the left. Down the stairs, a gentleman sat tending the fire which heated the hot water for the hammam! Locals also brought him things to be cooked in the fire. From there we weaved past businesses, mosques and homes with countless varieties of doors. I just loved the doors…tall, short, decorative, plain, wood, metal…many decorated with the Hasma (or Hand of Fatima), the universal sign of protection. As we walked, Youssef was quick to explain to us Islam and to discuss his beloved king. Islam encompasses Surrender, Submission, Obedience, Sincerity, and Peace. As an American, it was nice to hear his explanation, as unfortunately we only hear about Islam through the sensational seeking media when something awful takes place. Jetlagged, I certainly can’t recall all he told us, so in an effort to provide accurate information, I found this website. The Moroccans love King Mohammed VI. He is the son of Hassan II and took over the throne upon his father’s death in 1999. He is the first Moroccan King to have only one wife. Men were allowed four wives until the King enacted a new family code or Mudawana that limited the terms of polygamy as well as provided more powers to women. He was also the first King to show his wife to the public. While a progressive King, he also named the traditional Berber language to be the official language along with Arabic, and it must be taught in school along with French and English. Mohammed graciously welcomed us to his store in the Marrakesh medina. First we sat with the lady weaving a rug and got to try it ourselves. We were quite slow at the process. Next we sat in the center of the room, as two men brought rugs from all corners of the store and ceremoniously spread them out for us to see. They were made from different types of wool, had different patterns, and came in all shapes and sizes. Suman quickly narrowed her search down to small with purple colors. After the rug selection, the business deal is not complete without a cup of mint tea. Youssef and Mohammed escorted us to the rooftop, where we looked out above the souks and sipped the sugary drink. In fact, I joked about having tea with your sugar as opposed to sugar with your tea. The ratio is five teaspoons of sugar to one teaspoon of tea! There is a ritual to the tea pouring as well. First a glass is poured which is then put back into the tea kettle in order to mix the tea. Next the tea we drink is poured from about 18 inches high in order to create a little froth on the surface. It is customary to have three glasses of tea too. The first glass is as gentle as life. The second glass is as strong as love. The third glass is as bitter as death (as the tea gets stronger as it steeps). It is known as Berber Whiskey due to the daily, social interaction that takes place around tea drinking. We stopped at two glasses before we bid our farewells. From Dar Mejbar, we continued through the souks. There were souks that were mainly working areas for blacksmiths, woodworkers and leather tanners which I really liked. Then there were souks that sold the handicraft items including but not limited to purses, lanterns, shoes, vegetables, meat, fabrics and much more. It was a photographers dream if it weren’t so hard to snap photos. Women, in particular the most conservative who were draped in clothing from head to toe with only their eyes showing, did not want their pictures taken. It seemed sort of ironic since it was impossible for the regular person to tell who they were. Others wished to be paid for a photo. As such, I sneaked photos from a dark corner careful to avoid the moped zipping between pedestrians. Occasionally I resorted to my iphone for a quick snap or settled for shots at places where Suman shopped. We walked by the communal oven for baking bread (though it wasn’t open) on our way to a lantern shop as well as a spice shop before we passed by a square and were eventually led to the main tourist section, Djemâa el Fna. This centuries-old square, once a meeting point for farmers, tradesmen, storytellers and healers, is now home to snake charmers, transvestite dancers, women that painted henna design, and countless food carts that mostly sold smoothies. It was surrounded by many terraced cafes as well that provided a nice place to view the chaos and the sunset. Upon our arrival in the Djemâa el Fna of the Marrakesh medina, we said good-bye to Youssef. I highly recommend him. He may be contacted at Y.kharroubi@yahoo.com and his website is Www.marrakechtourguide.com. Suman found him on Viator. Before we left him, he pointed out the restaurant where we should get a tajine. In addition, he told us to carry our valuables in front of us, suggested to keep walking, and then provided rather simple directions to our riad. We were to take the first right, then the first left. We had to pass by the colorful paintings we saw earlier and turn right at the vegetables. If we got lost, we were supposed to ask an older person. We heeded his advice and went to the second floor of Restaurant Chez Cehgrouni to eat our tajine of lamb for only $6 as we looked out over the busy square. He pointed to our right. Soon we found an area we recognized and the rest of our way home. Next Post Hiking in the High Atlas Mountains! Absolutely fascinating! Loved this blog and Suman’s rug choice!